Coconut Ice. That's what the label says, so what more do you want to know? I can’t get enough of British Pantry, a great little British import shop in northwest Calgary. A couple of months ago, I asked them if they could bring in coconut ice, one of my favourite childhood treats. They told me they’d look into it, but I assumed they wouldn’t be able to track any down. Welllll … while doing a bit of Christmas shopping there, I found a box of the bars at the back of the store, just waiting for me. I thanked the shopkeeper profusely. Why do I have such an attachment to coconut ice? Simple. 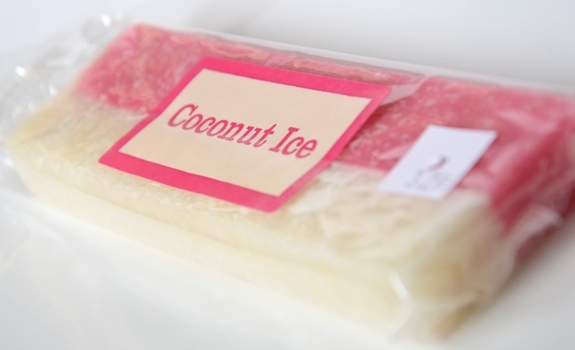 This treat will always be linked in my mind to my mum, who introduced me to homemade coconut ice at an early age. If I remember correctly, it’s remarkably easy to make: it’s mostly just a blend of coconut, icing sugar and water and/or milk, though this one is a bit different – there’s no milk listed in the ingredients, but it uses vegetable oil and glucose syrup. The Pitch: “Coconut Ice.” Seriously. Hardly anything on the label. Either you know what it is and snap it up as soon as you see it, or you fly blind and buy the candy on the strength of mystery. 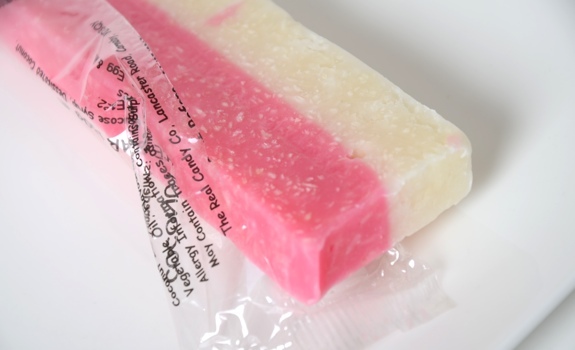 The Look: A hard, compressed bar of sugar and white and pink coconut, pressed together into a long, slender brick. The clear plastic wrap lets you see what’s inside. The Taste: Softer than it would appear, the sugar melts away in your mouth, leaving bits of creamy coconut on your tongue and buried in your cheeks, like a mega-hamster mouth-pouch-stuffing Kleenexes. At times, it has a bit of caramel to it, though this falls back as the coconut flavour takes over. I’ve had raspberry-flavoured coconut ice before, but this is straight up soft, ultrasweet coconut. And it’s delicious. Note the flecks of coconut in the coconut ice. If you like sugar and coconut, you're in for a treat. Cost: $3.29 for a 150 gram bar at British Pantry in Calgary. Value for cash money: Good. Can/should be shared or eaten over multiple sessions. Availability: In Canada, limited. If you’re in Calgary, get it at British Pantry. In Edmonton, try Hub Cigar (they’ve had it in the past, though their stock seems a bit random at times). Nutrition? : Absolutely no idea. No info listed, but, based on the ingredients, there’s probably not much here other than sugar calories and some fat from the vegetable oil. The verdict: If you like sweet, sweet coconut, it’s bliss. Looks interesting. I”ll have to check out Hub cigar. I love coconutty things. If they don’t have it at Hub, try making a batch at home. 🙂 There are lots of recipes online, and it’s surprisingly simple to whip up. I absolutely love coconut and you’ve got me interested in finding a recipe and making my own. I’ll check a few shops here, but I rather doubt they carry this item.